Vanzara said the pen in the garland is a “symbol of wit”, and the pistol of “power”. RETIRED IPS officer D G Vanzara, accused in the encounter cases of Ishrat Jahan, Sohrabuddin Sheikh and Tulsi Prajapati, Sunday stirred a controversy when he put a garland with a toy pistol around the statue of Sardar Vallabhbhai Patel at a rally organised by his supporters in Surat. The incident triggered sharp reactions from Congress as well as the Patidar Anamat Andolan Samiti (PAAS) whose members removed the garland after Vanzara left the venue. 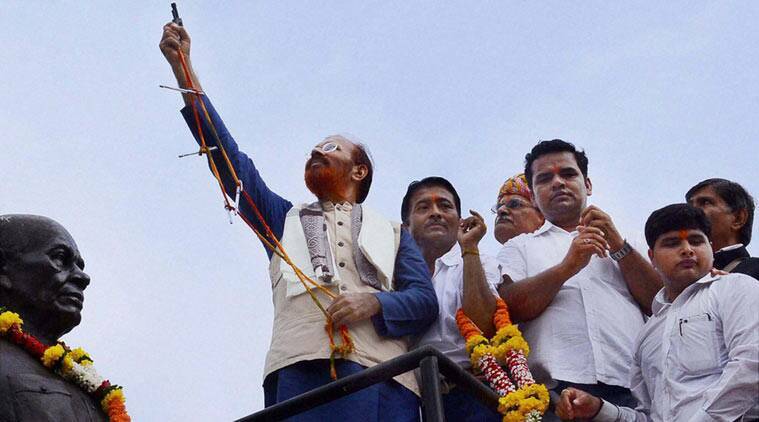 When asked about the rationale behind offering such a garland, which also had a pen, Vanzara told reporters that it was a “symbolic tribute” to Patel’s contribution to uniting hundreds of princely states after Independence. “It was Sardar Patel who had convinced more than 665 princely states to join the Union of India after Independence. Though the majority of states got convinced and acceded, some like Junagadh and Hyderabad raised their heads in protest. In such a scenario, Sardar kept aside his pen and took up the gun,” he said. Vanzara said the pen in the garland is a “symbol of wit”, and the pistol of “power”. “Sardar Patel used both of them (pen and pistol) to build a united India. That is why we have garlanded Patel’s statue with pen and a (toy) gun to pay tribute to this great leader,” he said. Condemning the act, former Congress MP and Sardar Vallabhbhai Patel Memorial Society chief Dinsha Patel demanded an apology from Vanzara. PAAS, fighting for quota for Patels, also demanded an apology from Vanzara. “He has insulted a great leader. He has hurt the feelings of Patel community. Sardar Patel always walked the path of peace and never advocated violence. We have demanded an apology from him,” said Surat PAAS convenor Nikhil Savani.